More than 20 million seniors visit our nation’s emergency departments every year. With the number of older adults growing rapidly, there is a critical need for more geriatric-focused care, which has the potential to improve health outcomes, coordinate care more effectively, and reduce costs. 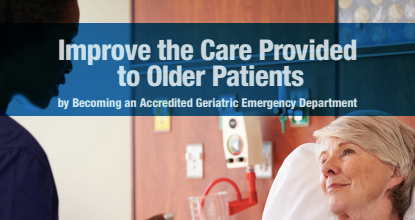 Download this brochure, supported by West Health, to learn more about the American College of Emergency Physician’s Geriatric Emergency Department Accreditation (GEDA) program that was developed by leaders in emergency medicine to ensure that our older patients receive well-coordinated, quality care at the appropriate level at every emergency department encounter.